So am I the ONLY person on Earth to not realize that Forever XXI has an outlet site? Of course there are TONS of stores by me, but who knew there was an actual outlet site! I am going to go insanely crazy (if at all possible) on this site once I get a chance to actually sit down and browse through everything! In the short amount of time that I glanced at it, I saw a few items that I knew I wanted to get! Come in and take a look! 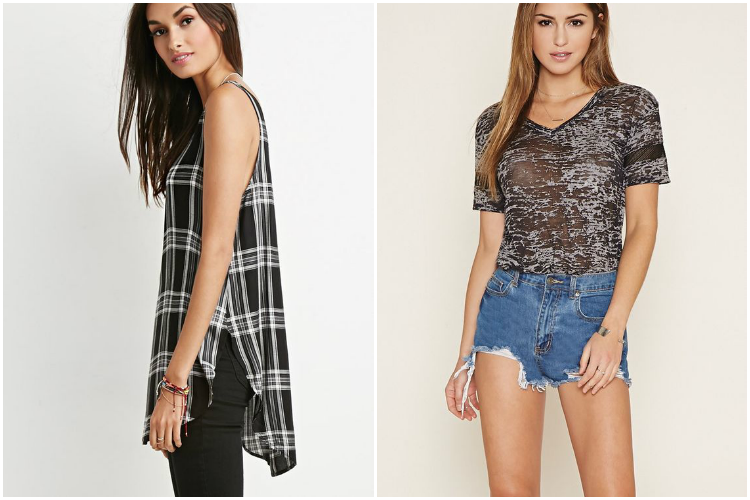 As if there wasn't enough reasons to love F21, not one item on the website is over $20! A fashion bloggers dream, right? I keep saying to myself "Hurry up Thursday!" - my next off day! I saw these and instantly fell in love! 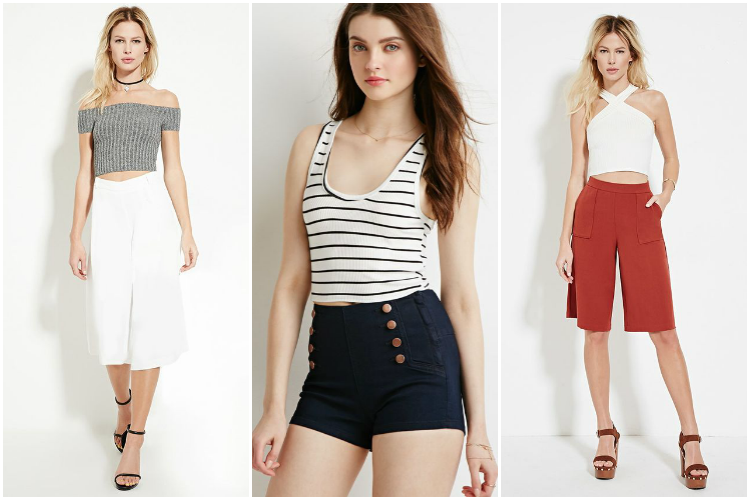 I am really into culottes since I'm just getting used to wearing shorts. I've always been uncomfy with shorter shorts because of the lower part of my legs are smaller. It just looks very weird to me. Hopefully with all of the leg exercises that I'll be implementing, they will gain a little and I won't be so weird about them! That's why I threw the high waist sailor shorts in the mix! Such a fan of all both the pant romper and the long dress! Blue is slowly, but surely becoming one of my favorite colors and you cant go wrong with a good ol' sundress. The dress in the middle is great for a casual day. It's kind of short, I think that's my only apprehension, but for $5, I could definetly get over it! Cant ever have too many tops! I have been looking everywhere for more burnout tops and they are either bulk sale items or ridiculously overpriced, so this one caught my eye! So this is my absolute favorite piece that caught my eye during my short glimpse of the outlet site. It's perfect for a night out without having to go extremes! Throw on some strappy sandals and you could be on your way! And who doesn't love a classic midi circle skirt! I'm pretty sure that with time, there will more items added to their selection! 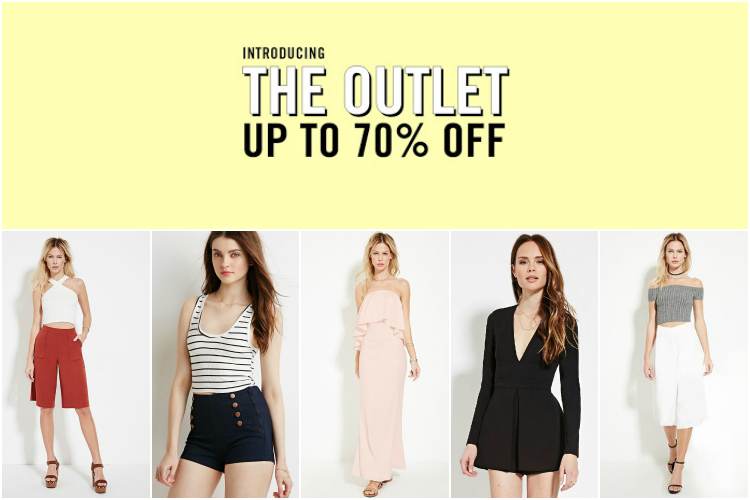 So tell me, am I really the only one in the dark about F21 - The Outlet? I can't wait to sit down and browse the selection a little better and make a purchase!